This article provides a simple application with the ability to manipulate a flat file database (text files). 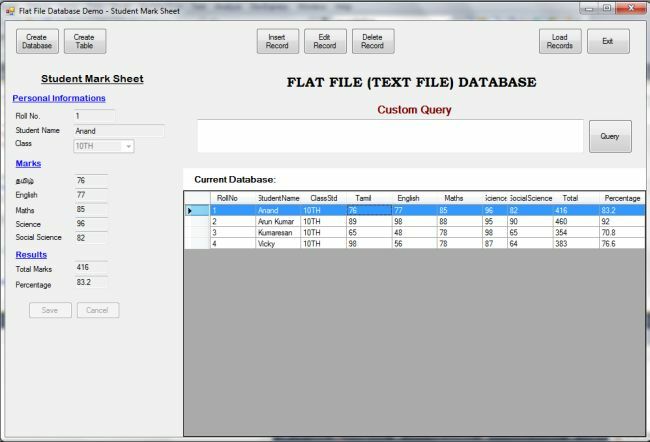 This article is fully based on how to query a flat file database (in other words text file database). The flat file database querying is quite difficult. I write this article to create a simple application with the ability to manipulate the flat file database (in other words text file). 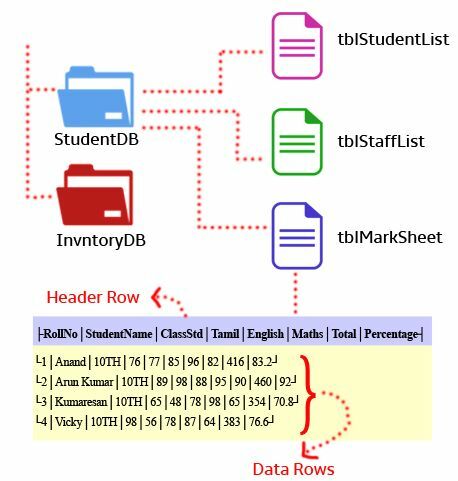 This is a basic database system. It makes our work easier compared to writing the data on paper. It saves paper. A flat file database is the simplest form of database system. There is no capability of accessing multiple tables like a RDBMS Because it uses a simple structure, a text file is considered as a table. Every line of the text file is a row of the table and the columns are separated by delimiters like comma (,), tab or some special character. The database does not have a specific data type. It only supports strings. The system based on File Input Output processing and Streams. This system is also the same as a flat file database except we can use multiple tables. The similarity is the multiple table querying such as Join queries are not processed currently. A database is nothing but the folder for the database. The Name the application's startup folder. A Header Row consists of the column names. Data Rows consist of the records related to the columns. Here some special symbols are used as delimiters. The system supports 15 or more SQL Type Queries to query the database. The following queries are used in this system. This is the query for creating the database named "StudendDB". This query shows a list of databases in the system. This query deletes the database StudentDB. This query holds the StudentDB database name for further database manipulation quries such as INSERT, DELETE, UPDATE, SELECT and so on. This query shows the tables in the database that are currenlty held for manipulation. This query deletes the table from the database. This query crates a tblMarkSheet table with the columns RollNo, StudentName, ClassStd, Mark1, Mark2, Mark3, Total and Avg. In the background it creates a file named "tblMarkSheet.fdb" in the "StudentDB" folder. This query inserts a record into the tblMarkSheet table. This query is the same as the previous insert query. The difference is we don't need to provide the column names. This query deletes the records with record column values equal to 10 in the tblMarkSheet table. This query deletes all the records from the tblMarkSheet Table. This query modifies the ClassStd field of the record that holds RollNo as 1. This query sequentiay updates the record that holds the RollNo as 1. Here we don't need to specify the columns to update, it automatically updates from the sequence and missed column values remain the same. Note: The queries 11 of 1.1 and 2.1 are executed without condition. This query is for viewing the records of the table. Here we can filter the records using relational operators. In UPDATE and DELETE queries it supports only an Equal (=) condition. It is not supported for other operators like <, >, <=, and so on. In a SELECT query the data filter feature is held using a datatable and dataview. Need to provide native support. There is no JOIN queries when compared to RDBMS. It is our own database system, so we can modify the transactions of the database system. Compared to other database systems it is quite small and slower but security things are ours. So we feel free about data security. We can ensure the security by using cryptography things in this system. We can modify the table structure in encoded text. So that no one knows the inner structure of the database. There is no data theft. In the future it will be portable for more security and a fully enhanced database structure. It could support JOIN queries. The demo form has been designed to examine the flat file database operation. It has database creation, table creation, record insertion, record deletion, record updation, loading records and custom query execution. In addition it has IntelliSense TextBox for easy query writing. The form layout is fluid and exactly fit for all screens.